NC State’s Chancellor’s Faculty Excellence Program showcases the university’s commitment to interdisciplinary excellence and field-leading faculty. Cluster faculty turn research into real-world solutions while providing students with well-rounded experiential education opportunities. 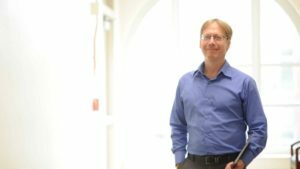 We spoke with Fred Wright, a member of the Bioinformatics cluster and director of the Bioinformatics Research Center, about his research and the impact of interdisciplinarity at NC State. What is your role within the Bioinformatics cluster and what are your primary research interests? I was hired as a member of the Bioinformatics cluster in 2013 — partly because of my research, but also to be the director of the Bioinformatics Research Center. This interdisciplinary research center, established in 2000, brings faculty from different colleges and departments together who have complementary interests in using quantitative reasoning to solve biological problems. We have faculty from departments like biological sciences, statistics and chemistry who represent interdisciplinary work, but physically are in the Ricks Hall third floor facility. The idea is to conduct research, pursue grants and further our work by virtue of being close together physically. My own work covers a number of areas in statistical genetics. Most of my research concerns gene mapping or genomics and relating those to diseases in humans or model systems such as mice. I collaborate with others to gather what we call “omics data,” which could be DNA in mice or humans, or it could be what’s known as expression data, which represents the degree to which genes are turned on and turned off, and that can vary by tissue and vary over the lifespan of an individual. What do you hope to achieve through the research being conducted in the bioinformatics cluster and the Bioinformatics Research Center? The cluster did a lot to strengthen environmental bioinformatics instantly. Professors David Reif, Denis Fourches and I spend part of our time working on the application of genomics to toxicology, as well as chemical informatics. This is an important emerging research area that combines traditional toxicology with new omics methods. The Triangle area is quite strong in this area, even though there are relatively few people working in this combined field. To have three people in that one cluster automatically made us much stronger as an institution in bioinformatics. In addition to adding to the original strengths of statistical genetics within the center, enhanced environmental work was something the cluster was able to bring to campus. Additionally, the Bioinformatics cluster builds on existing strengths within the Bioinformatics Research Center. Our other cluster member, Dahlia Nielsen, represents strengths in statistical genetics, combining a deep understanding of biology and statistical genetics with the most modern technology. What is your favorite part of being a researcher? It is cliche to say that we like the excitement of discovery, but it is true. Just sitting at a computer and suddenly seeing a pattern in data that no one had ever noticed before is something that researchers have to live for, because otherwise, why are you doing that? In my role as director, I get some satisfaction in seeing that we’ve been able to grow, sometimes in the face of difficult funding situations. Much of this, due to the vision of the chancellor and provost, to have this faculty excellence program, has been one of the ways in which we have been able to grow. Helping to steer that and seeing that we’re bringing in excellent people gives me a lot of satisfaction. How does interdisciplinarity impact both faculty and students? Research complements training, and traditionally that’s been thought of as something most applicable to graduate students. Increasingly we’re seeing the involvement of undergraduates in research and it is something that has taken hold on other campuses and is starting to take hold here. I’ve had some undergraduates training in our group and there are other faculty involved with the center and with the cluster who are actively engaging undergraduate students.That kind of exposure in the early stages of academic development is certainly good for the students. For us it is an extra set of hands and it helps develop a researcher pipeline. There are quite a few students who remain local or they may go off and get a master’s degree somewhere else and come back here for a Ph.D. All versions of this are very good for us — for the center, the cluster and the institution. We create the research space so that research can thrive and so that students — no matter their eventual career goals — are able to see what it means to generate knowledge. What is something people may not know about the Bioinformatics cluster or the Bioinformatics Research Center? We’re very approachable! There are some students who have been trained in biology who may not realize that with a reasonable amount of training — maybe a few months of training in computer languages — they can do something in bioinformatics. There is a startup cost to be able to do interdisciplinary work. You have to understand at least a little bit about multiple disciplines, but it is not necessarily as high a barrier as some people think. We provide formal training opportunities as well as self-taught experiences that can often get people to the point where they understand enough to be able to engage in the process. Another thing is people don’t realize how many jobs there are in this area in particular. Data science is increasingly something that people are focused on. We have a large number of students who have graduated and gone on to very good positions here in the Triangle and across the nation. Bioinformatics is a bigger area that many students realize. New research indicates that environmental factors during the periconceptional stages of pregnancy (pre-conception to early months of carrying) are associated with neurodevelopmental outcomes in offspring. Specifically, children born to mothers who adhered to a Mediterranean diet rich in fresh vegetables, whole grains, healthy fats, nuts, legumes and dairy, along with decreased red meat consumption, were found to exhibit more favorable behaviors in the second year of life. Utilizing data based on more than 300 mother/child pairs, the goals of the study were to determine if, and to what extent, a mother’s dietary patterns around the time of conception affected her child’s epigenetics and behavior. The NEST cohort was started by Dr. Cathrine Hoyo of NC State’s Center for Human Health and the Environment (CHHE) and has yielded over 55 publications to date linking maternal exposures to offspring outcomes and epigenetic. For this study, data was collected on maternal diet around the time of conception and on child behavioral characteristics in the second year of life for 325 mother/child pairs. Child behavior was assessed using the Infant Toddler Social and Emotional Assessment (ITSEA) questionnaire at 12-24 months of age. For a smaller subset, the methylation percentage of 49 CpG sites in the control regions of 9 imprinted regions were also examined in relation to maternal diet and child behaviors. These were conducted on cord-blood DNA from offspring. Initial research efforts focused on maternal Mediterranean diet adherence (MDA) as it remains one of the most highly researched dietary pattern. Maternal Mediterranean diet adherence was associated with favorable offspring behavioral patterns, as well as with epigenetic changes in control regions of imprinted genes. Compared to children born to mothers least adherent to a Mediterranean diet around the time of conception, children born to mom’s with high MDA were less likely to display depressive and anxiety-related behaviors, and less likely to display atypical, maladaptive and autism-related behaviors. Furthermore, maternal MDA was also associated with changes in the methylation of the control regions of MEG3, IGF2, and SGCE/PEG10, which have been associated with multiple environmental exposures and offspring outcomes. Although the study was not designed with to demonstrate that the observed methylation changes in these genes mediated the associations of maternal MDA and offspring behavior, the directions of effect were consistent (see figure link). Maternal obesity has been linked to increased incidence of neurodevelopmental offspring outcomes such as ADHD. Although the Mediterranean diet has been associated favorably with many human health outcomes, this is the first time that this periconceptional dietary pattern in human mothers has been associated with favorable offspring neurodevelopmental outcomes. The exciting thing is that people can change their diets and this may be a way to positively impact neurodevelopmental outcomes such as ADHD and autism, each of which have experience increased incidence in the last 3 decades. Ultimately, understanding the role epigenetics plays in linking environmental exposures such as maternal diet to offspring outcomes will offer insights into the development and testing of early intervention measures, either in utero or during the early stages of childhood development. Researchers and co-authors involved with this study include John S. House, Michelle Mendez, Rachel L. Maguire, Sarah Gonzalez-Nahm, Zhiqing Huang, Julie Daniels, Susan K. Murphy, Bernard F. Fuemmeler, Fred A. Wright, and Cathrine Hoyo. The research was supported by National Institute of Environmental Health Sciences of the National Institutes of Health (P01ES022831, R21ES014947, R01ES016772, R01HD084487, and P30ES025128) and by the U.S. Environmental Protection Agency (RD-83543701). Additional support was provided by the National Center for Advancing Translational Sciences (UL1TR001117). Arabidopsis thaliana, a small flowering plant in the mustard family, was the first plant to have its genome sequenced. A. thaliana can be thought of as the “mouse model” of botanical research – just as the lab mouse has formed a cornerstone of research in mammals, A. thaliana is used to demonstrate genomic principles that are far-reaching and pertain to multiple plant species. As part of an investigation of polyploidy, Dr. Gavin Conant has extensively analyzed the genes of A. thaliana. Polyploidy simply means that each cell of an organism has more than two sets of chromosomes. Conant explained that duplication events creating such polyploid organisms have occurred across many species throughout the course of evolution, often several times in the same group. Most often, the genome doublings are coupled to a hybridization between two species and help mitigate some of the problems such crosses might otherwise induce. He relates the idea to a more familiar example in mammals. “For instance, the modern carnivorous marvel liger, which blended the genes of a lion and a tiger, has valuable traits. However, it will often be sterile, unable to reproduce and thus, sustain itself without direct human intervention,” said Conant. Polyploidy often results from an event in which two sets of chromosomes are pulled from each parent, instead of the usual single set. Shortly after this conjoining, many of the acquired “extra” genes from the hybrid parents are discharged from the cells and lost altogether. Common sense might dictate that this would be a balanced process, selecting an equal number of genes from each parent. Instead, many geneticists believe that this process of gene selection carries a measure of preference, a term known as biased fractionation, but the evidence for this claim has been controversial. 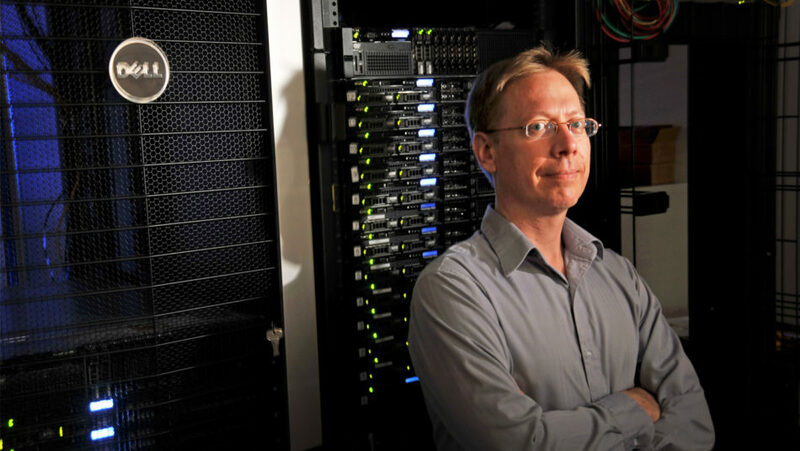 Conant’s methodology, an algorithmic computer program he designed as a postdoctoral fellow, allowed him to confirm this bias by testing many genomes simultaneously, as opposed to the previous method, which tested one polyploid genome at a time. Beginning as a class research project (taught by Conant) at the University of Missouri, researchers compared the polyploid genomes of Arabidopsis plants against non-polyploid, closely-related species. The objective of the study was to estimate the strength of the bias observed after the polyploidy event. The research team built two models, one with the selection bias built-in, and one without. Utilizing data extracted from Conant’s program, the research team concluded that the loss pattern in the duplicate genes aligned more closely with the bias model, supporting that the genetic fractionation in polyploidy beings is indeed biased. Suspected reasons for this bias vary, but it likely is the result of the combinatorial manner which genes function. “Genes work together in tandem to perform certain functions. To work effectively, those gene groupings must all be from one parent. Matching individual genes together from both parents would be like taking certain parts from the engine block of a Ford and attempting to combine them with engine parts from a Chevy. Those parts are specifically designed to work together for that exact function. This is probably why the polyploidy genome ejects certain genes from one side, instead of maintaining a perfect balance,” Conant explained. Prior to joining the Bioinformatics Research Center (BRC) at North Carolina State University, Dr. Conant served as a postdoctoral researcher at Sandia National Labs. He studied biology and mathematics as an undergraduate, while working as an IT specialist. Following the completion of his PhD, he worked in Dublin, Ireland for nearly four years, where he conducted research involving baker’s yeast and its unique fermentation effects, which are likely due to an ancient polyploidy event. It was this background, combined with the clearinghouse of knowledge at the BRC, that facilitated the continued research of Dr. Conant and his fellow researchers. Dr. Conant’s lab is now applying similar methodology to eight fish species. Each of these fish contains a polyploid genome, while the gar fish serves as the non-polyploid counterpart. Fish polyploidy events are estimated to have occurred roughly 300 million years ago. Such an early event will be challenging to study – the Arabidopsis polyploidy event has been estimated as occurring only 25 million years ago. Researchers and co-authors involved with this study include Gavin Conant, Marianne Emery, M. Madeline S. Willis, Yue Hao, Kerrie Barry, Khouanchy Oakgrove, Yi Peng, Jeremy Schmutz, Eric Lyons, J. Chris Pires, and Patrick P. Edger. This work was supported by the US National Science Foundation (www.nsf.gov) under grant number NSF-IOS-1339156 (YH, EL, JCP and GCC) and by the US Department of Energy (www.doe.gov) under contract Number DE-AC02-05CH11231 (KB, KO, YP, JS). The work conducted by the U.S. Department of Energy Joint Genome Institute, a DOE Office of Science User Facility, is supported by the Office of Science of the U.S. Department of Energy under the contract number above. The funders had no role in study design, data collection and analysis, decision to publish, or preparation of the manuscript. NIEHS grantees developed a new method to identify individual-level genetic variation in response to chemical exposures. The approach, which linked zebrafish studies and bioinformatic approaches, might help identify new genetic factors that explain differences in chemical sensitivity. To find chemicals with patterns of differential biological responses, the researchers analyzed high-throughput screening data from zebrafish exposed to thousands of individual chemicals. Instead of focusing on particular compounds, the team looked at individually sequenced zebrafish from a diverse population and sought differences in susceptibility. The screening data pointed to abamectin, a commonly used antiparasitic, as a candidate chemical in which exposure produced different responses in zebrafish. The researchers generated genome-wide sequence data for individual zebrafish that were susceptible or resistant to effects of abamectin exposure. That data led them to a genetic region known as sox7 that was associated with the gene-environment effect. Targeted follow-up experiments confirmed that the susceptible zebrafish expressed a lower level of the sox7 gene than the resistant individuals. According to the authors, the approach provided a quick way to sort through the exposome of chemicals and to look for relationships between genetics and environmental exposure, rather than being limited to preselected candidate exposures. The ability to identify individual-level genetic variation that affects response to individual chemical environments may bring new precision to personalized toxicity prediction and understanding of how risk may differ across communities. Citation: Balik-Meisner M, Truong L, Scholl EH, La Du JK, Tanguay RL, Reif DM. 2018. Elucidating gene-by-environment interactions associated with differential susceptibility to chemical exposure. Environ Health Perspect 126(6):067010. 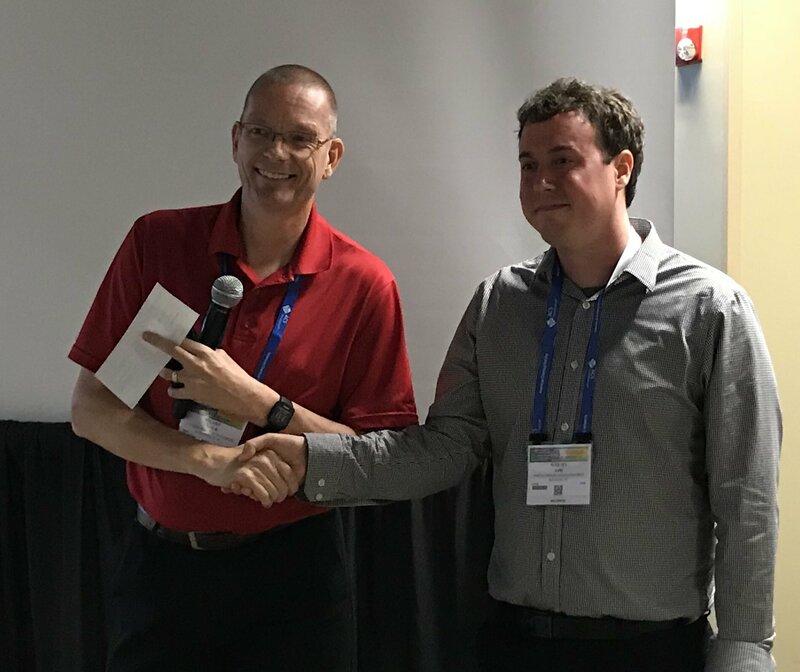 Jeremy Ash has been awarded his second CINF award during the ACS National Meeting. This is the first time ever a student has won this award two years in a row. Jeremy’s awarded research is devoted to the differential analysis of dynamic ERK1 / ERK2 – inhibitor interactions. Polyploidy occurs when two complete genomes from each of two parents, potentially of differing species, merge to form an offspring with four total copies of that/those genome/genomes. Polyploid is common in flowering plants and seems to give rise to important evolutionary innovations. However, it is unstable, and descendants of polyploid founders rapidly lose many of their duplicate genes. Previous analyses have argued that the losses tend to favor one of the parental genomes: however, methodological concerns have led to some doubt on this point. By modeling the resolution of these three polyploidy events across 21 genomes (10 plants and 11 yeasts), we confirm the existence of this bias in loss patterns and present new data to suggest that one source of the bias is selection to maintain function in co-adapted complexes from the alternative parental genomes. New research from North Carolina State University sheds light on the ways in which environmental chemicals can affect vitamin D receptors (VDR). The work shows that compounds identified as possible VDR disruptors in the Tox21 database interact with VDR in vitro and supports the efficacy of high throughput screening programs to identify compounds of interest. To continue reading, click below. Congratulation to the BRC’s very own, Fred Wright, professor in the Departments of Statistics and Biological Sciences and director of the Bioinformatics Research Center, for being named as a Goodnight Innovation Distinguished Professor. The professorship was made possible by a gift from longtime NC State supporters Jim and Ann Goodnight. Wright is an internationally known biostatistician who joined the NC State faculty in 2013. His wide-ranging research interests include genomic bioinformatics, toxicogenomics and the statistical principles underlying high-dimensional data analysis. Wright has been principal investigator on numerous grants, with activities ranging from development of new methods of gene mapping to expression-quantitative trait mapping for multiple tissues. He was also principal investigator of an EPA-funded STAR Center to apply genomics principles to long-standing problems in toxicology. He is a key investigator in the International Cystic Fibrosis Genetic Modifier Consortium, which seeks to unravel the unexpected complexities of this disease, and in the GTEx Consortium, which seeks to assess genetic regulation in multiple human tissues. Wright has been awarded over $15 million in research grants over the course of his career. He has authored or coauthored more than 150 scientific publications and delivered more than 80 invited presentations. He is a fellow of the American Statistical Association and of Delta Omega, the public health honor society. Jim Goodnight is CEO and a co-founder of SAS, the world’s largest privately held software company. SAS emerged from NC State’s Department of Statistics when Goodnight was on its faculty in the 1970s. Ann Goodnight, a 1968 College of Humanities and Social Sciences graduate, is the senior director of community relations at SAS. She is a member of the NC State Board of Trustees and the Friday Institute National Advisory Board. The Goodnights are generous supporters of the College of Sciences and the university, establishing several professorships and the Goodnight Scholars Program and serving as co-chairs of the Think and Do the Extraordinary Campaign for NC State. 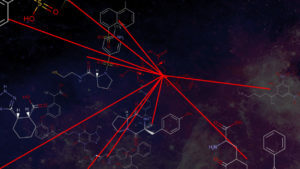 Researchers from North Carolina State University have created a new online service – ChemMaps – that allows users to interactively navigate the chemical space of over 8,000 drugs and 47,000 environmental compounds in 3D and real time. ChemMaps is designed to be a central resource for students and researchers who want to easily visualize and study complicated sets of chemical structures. The first release of the free-to-use website is available at www.chemmaps.com. Copyright © 2019 NCSU Bioinformatics Research Center. All rights reserved.